While researching this project, I discovered and made use of many fascinating TTC- and subway-themed online articles and resources. It’s my pleasure to share this extensive bibliography of assembled links (See also: Thanks and Acknowledgments for archival sources). I salute every valiant Rocket Rider who has completed this epic journey of exploration. True Torontonians, each of you! Suigi: TTC - What’s YOUR Station? If you’ve completed the trek and documented it online, send me a link and I’ll add it to this list of honour. Note: You only make the list if you exit the train at each station. Consequently Adham Fisher’s supposed ‘World Record’ 2:46:01 trip, while admirable in its own way, doesn’t make the cut, because under the bogus Guinness rules, you don’t actually have to exit the train to ‘visit’ a station. To me, that’s not really legit. Tunnel view looking east to Main Station, February 1968. Let me know if there’s a useful or interesting site or article about the TTC I ought to include! Note: I’m primarily focused on resources dealing with the subway, rather than the storied surface bus & streetcar network. The City of Toronto Archives hold a mind-boggling amount of TTC historical information. The official TTC Archives are housed here, as well as transit documents from the City. Go for a visit. Support them. Transit Toronto - this is a sprawling Toronto public transportation information site run by transit enthusiasts. Lots of historical documentation, and photographs. Steve Munro - Transit & Politics - Steve Munro is the city’s most astute independent transit advocate. The observations and discussion here lean heavily towards the technical, but the site is must-reading even if you don’t entirely agree with Munro’s occasionally-grumpy perspective on transit priorities. Wikipedia: Station Information. I have mixed feelings about the TTC related wiki pages. I link to individual station entries in this project. On the surface the articles are useful, but they often ramble—they aren’t of the consistent quality I’d expect of a good encyclopedia. CBC Archives April 4, 1954 : Toronto’s Subway Opens. (CBC archival link; better quality but finicky player). 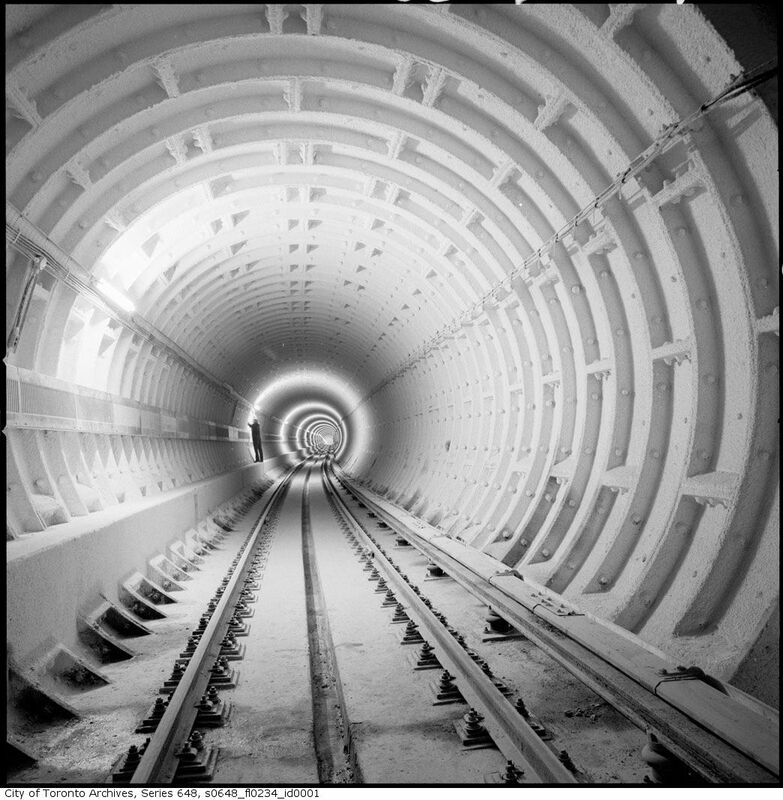 See also: February 28, 1966: Bloor-Danforth line on Toronto subway opens to public (alt link). James Bow: What’s Wrong With the TTC? Transit2000: Toronto’s Mass Transit System Ep. 6 (1992) An intriguing glimpse of the system in the early 90s. The RT is ‘state of the art’. CBC news video of the August 11, 1995 tragedy that claimed 3 lives: TTC Subway Crash. See also this, this, and Toronto Star: 20 Years after Russell Hill. Stephen Wickens: Architectural wankfests and standalone TTC stations. His other writing on TTC matters, particularly land-use planning, is trenchant. Undercover Boss (Canada) - Toronto Transit Commission. Set aside your political feelings about former Commission Chair Karen Stintz and enjoy this behind the scenes program; the insight into TTC worker’s lives is what’s valuable here. The Toronto Star: TTC Staff 'perform miracles' keeping aging streetcar fleet on track; TTC buskers share tales from the underground; Longest-playing TTC busker celebrates 37 years of performing for commuters; see also the CBC’s: TTC buskers get new underground ‘stage’. If you’re into TTC buses and other vehicles, peruse these admirably obsessive galleries from Ryan Flores. He also keeps a photoblog that periodically analyzes TTC wayfinding. It’s not subway-themed, but the Shuffle Demons’ Spadina Bus is practically obligatory. See also: Subway Blues by Broke Fuse. Full Frontal T.O. : Exploring Toronto's Architectural Vernacular, Patrick Cummins & Shawn Micallef, 2012, Coach House Books. I feel a partial aesthetic affinity with Cummins’ methodical ‘face-on’ street imagery. For an easy-to-read, broad history of the TTC, I recommend The TTC Story: The First Seventy-five Years by Mike Filey. Edward Levy: Rapid Transit in Toronto, is a solid and depressing historical review of Toronto transit plans. An earlier version used to be online; I’ve put in a request that the TPL acquire a couple of copies for lending. For an extensive technical overview of how the original Yonge line was built and operated, I suggest a scan of Canadian Transportation, December 1953, available at the Toronto Reference Library. Jay Young’s dissertation on the evolution of the Toronto subway up to 1978 is dryly erudite (as befits its academic context), and covers a wide scope of discussion material. Young provides an engaging look at the social context of various phases of the subway’s development. A highly recommended skim. Finally, there’s Transit in Toronto: the story of the development of public transportation in Toronto, from horse cars to a modern, high speed subway system, and John Bromley’s Fifty years of progressive transit : a history of the Toronto Transit Commission. Both are available via the TRL or at the City Archives.